The clash was reminiscent of various occasions when Mr. Trump has directly undercut subordinates, as when Mr. Tillerson broached the idea of negotiations with North Korea and the president scolded him on Twitter not to waste his time. Many in Washington and at the United Nations were riveted by the sharp exchange on Tuesday between the White House and its senior international diplomat. The argument that Ms. Haley had merely gotten out ahead of a decision was undercut by the fact that the White House itself had sent out word to surrogates on Saturday — the day before her remarks — letting them know that it had already decided to take punitive action against Moscow. And yet an administration official said there was a quick recognition on Sunday that Ms. Haley had gone too far in her remarks on “Face the Nation” on CBS. This official said that the State Department called an aide to Ms. Haley shortly after she appeared on the show, to suggest she issue a correction. Ms. Haley’s aide replied that her office was considering a correction, but none was ever released. Instead, the White House was left to say the next day that no sanctions had been approved. Such conflicts leave foreign governments in a bind as they try to interpret American moves. Beyond the immediate disconnect, though, is a deeper strain between Mr. Trump and Ms. Haley, according to administration officials and other insiders. 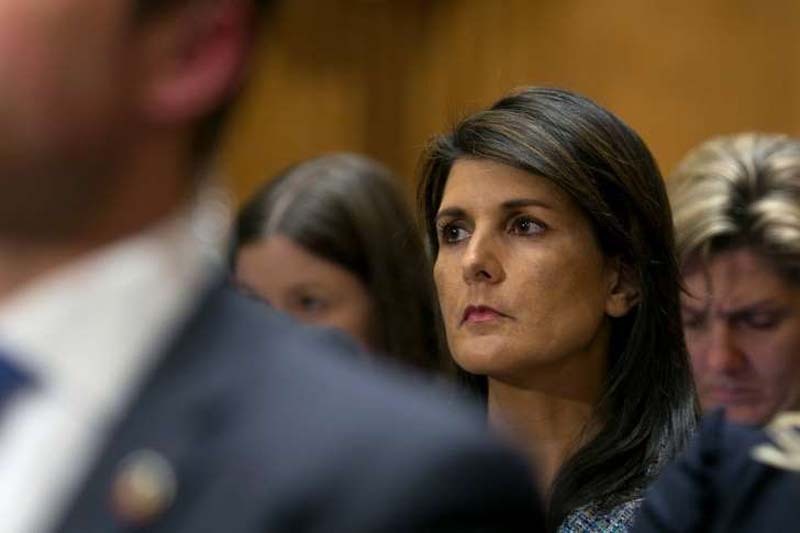 Ms. Haley has been perhaps the most hawkish voice on Russia on a team headed by a president who has emphasized his fervent desire for friendship with President Vladimir V. Putin. At times, that serves the president’s interests because she can say what he will not. But at other times, he has grown exasperated by her outspokenness. A former governor of South Carolina, Ms. Haley has assumed a more prominent role than most of her predecessors, at times eclipsing the secretary of state. And along the way, Mr. Trump has grown suspicious of her ambition, convinced that she had been angling for Mr. Tillerson’s position and increasingly wondering whether she wants his own job. Republicans close to the White House whisper about the prospect of an alliance between Ms. Haley and Vice President Mike Pence, possibly to run as a ticket in 2020. Aides to both scoff at such suggestions, but the slightest hint of such a pairing would be likely to enrage Mr. Trump, who has made it clear that he plans to run for re-election. The talk was exacerbated in recent days when Mr. Pence named Jon Lerner, Ms. Haley’s deputy, as his new national security adviser, while allowing him to keep his job at the United Nations. That plan collapsed within 48 hours when Mr. Trump grew angry at reports that Mr. Lerner had made anti-Trump ads for the Club of Growth, an economic conservative advocacy group, during Republican primaries in 2016. Mr. Lerner stepped down from the job in Mr. Pence’s office. Ms. Haley draws strong feelings on both sides of the aisle. In Republican circles, she is a favorite of neoconservatives and national security hawks like Senators John McCain of Arizona and Lindsey Graham of South Carolina, but viewed skeptically by the more isolationist wing that sees Mr. Trump as a champion. Among Democrats, she has respect from those who see her as a voice of reason and scorn from others who see her as overly combative.